Agneta Pleijel was born in Stockholm, Sweden. Her parents were Åke Pleijel, a mathematician, and his wife Sonja Berg Pleijel, an author and musician. When she was a teenager, her father's career brought the family first to Lund, and then to Princeton, New Jersey. Agneta studied ethnography, philosophy and literature at the University of Gothenburg. In 1973, she began her career as a literary critic, working for Swedish national publications such as Aftonbladet and Word & Bild. She made her debut as a playwright together with Ronny Ambjörnsson in 1970 with Ordning härskar i Berlin (Order Rule in Berlin); in 1977, she wrote the drama Kollontaj about the Russian revolutionary and diplomat Aleksandra Kollontaj. 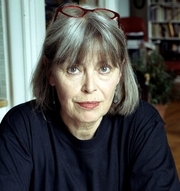 Her first poetry collection was entitled Änglar, dvärgar (Angels, Dwarves, 1981). Six years later, she released her first novel, Vindspejare, which contains autobiographical material about five generations of a family similar to her own with roots in Sweden and the Dutch East Indies. Other novels include Hundstjärnan (1989), Fungi (1993), and Lord Nevermore (2000). She also has written the screenplay for several films. She has served as chair of the Swedish PEN Club, and from 1992 to 1996, she was a professor of drama at the Dramatiska Institutet (Dramatic Institute). Agneta Pleijel is currently considered a "single author." If one or more works are by a distinct, homonymous authors, go ahead and split the author. Agneta Pleijel is composed of 3 names. You can examine and separate out names.